Does teaching poetry stress you out? 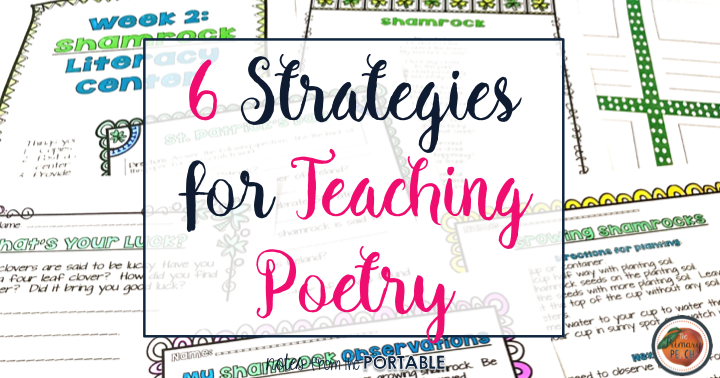 Try these 6 strategies for teaching poetry to get learners to fall in love with poetry. Many styles of poetry use a certain format. Using templates allows learners to really focus on word choice. Learners don't have to focus on the structure with templates. Giving access to a thesaurus and dictionary will help writers find the best words to fit their poem. A poetry close read can help readers make inferences and connections. This simple close read guide can be used with any poem. The questions guide readers to understanding the parts of poetry, identify key terms, and search for main idea. Take me to the FREE Poetry Close Read. Make poetry part of your guided reading lessons and literacy centers. Keep it up and running with a poetry book basket and the poetry close read. Want poetry book suggestions? Do you want poetry literacy centers that are already prepared? These monthly poems will allow for you to cover all holidays and seasonal themes. A test-prep/close read guide, written response, poetry writing lesson, and content area connection is provided for each poem. Use poetry as part of your daily read aloud. Poetry is perfect for read alouds especially on those days when you are running short on time. Check out this article to get suggestions of poems that will keep your students reading poetry all year long. Each month includes a FREE set of questions and activities. Take me to the FREE monthly poetry resources. Use found poetry to help students identify the main idea of a passage. Have students highlight the important words and phrases as they read. Then cut out the highlighted words and organize them into a poem. Click here for a FREE Lesson Plan for Found Poetry. Keeping up a poetry word wall is a great way to help students learn those important terms. Put it up near your literacy center. This poetry word wall has terms and examples. You can color to meet your classroom decor or for student notebooks. Or just print and go. Take me to the Poetry Vocabulary Book. Want to save this article? Pin this! Wonderful blog.You have briefly described about "Strategies for Teaching Poetry ." Well, I'm a writer. I have written an article similar to this topic and it was published in best essay writing service. I hope even if you produce this stuff to such sites, will be much more better. คาสิโนออนไลน์ A gambling website that gives you all the bets on the selected gambler. Make profits to gamble on every possible day with the selected gambler. Always give good returns. The profit is very high. Gambling and betting on the best bet. The return of the lot. I would like to bet on the real chance to play gambling luck always anywhere. Organizing Your Weekly Copies- Easy as 1, 2, 3!